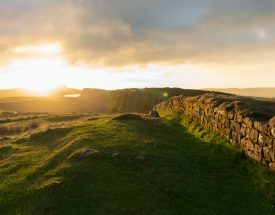 The oldest and most iconic National Trail offers a rugged taste of Northern England – stretching from the Peak District to the Scottish Borders on a challenging but rewarding route of remarkable contrasts. Explore the Pennine Way for three days, a week or even longer. Find inspiration for your walking adventure using our suggested itineraries, or select one of our bookable itineraries which are highlighted with a star. Walk the backbone of England from the rugged Peak District to the Scottish Borders on the country's first National Trail. Discover the highlights of this famous National Trail in a 74-mile route that can be comfortably managed in 8 days. 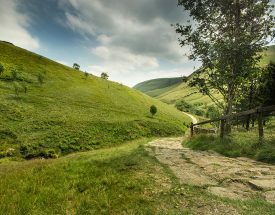 Spend a week enjoying classic day walks in the Peak District, based in the idyllic village of Edale. Hike the dramatic and demanding final section of the Pennine Way on this spectacular 6-day itinerary. Walk the opening sections of the Pennine Way on a 4-day itinerary from the Peak District to Yorkshire. Find useful facts and learn more about the Pennine Way below. Select the blue tabs below for more details. 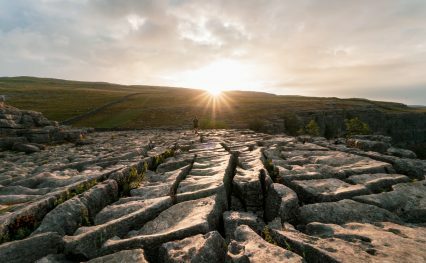 Steeped in history and traversing spectacular landscapes, the iconic Pennine Way stretches for 268 miles (435km) across England’s wild northern uplands. 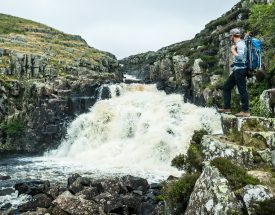 The route follows Britain’s rocky spine from the hills of the Derbyshire Peak District and the Yorkshire Dales, through the stunning Swaledale Valley, across the North Pennines and over Hadrian’s Wall in Northumberland to the Cheviot Hills, ending in the Scottish Borders in Kirk Yetholm. The Pennine Way was the first National Trail in England and is one of the UK’s most famous long-distance walks. Opened on 24th April 1965, it paved the way for public access to some of England’s wildest landscapes. 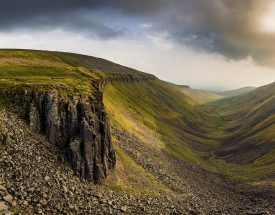 With a combined ascent that exceeds the height of Mount Everest, the Pennine Way is arguably the most challenging National Trail in England and the route is recommended for experienced walkers who want a unique experience – but you don’t have to walk it all at once. The Pennine Way is hilly and often remote. The terrain is varied and in some places the paths are smooth and firm, but in others the path may be narrow and uneven or wet and boggy. It’s best to take waterproofs and plenty of dry socks. 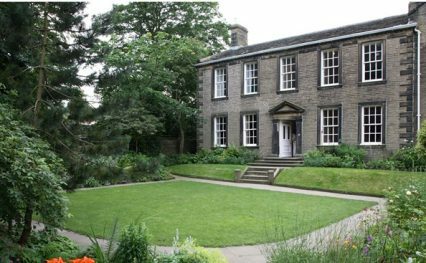 To really make the most of your trip, schedule a rest day at places such as Hebden Bridge, Skipton, Hawes, Appleby or the Hadrian’s Wall area, and spend some time exploring. 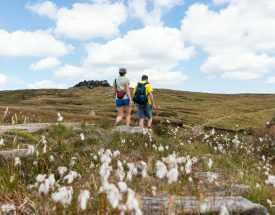 The best months to walk the Pennine Way are from mid-May to September, when the weather is usually better, however the Trail can be walked all year round. Expect snow on the northern sections in winter months. 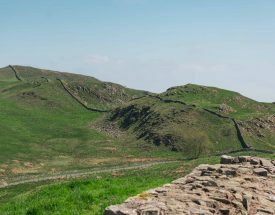 To many people, the Pennine Way is much more than a walk; it is part of the history of access to the hills in England and walking the Trail makes you part of that story. 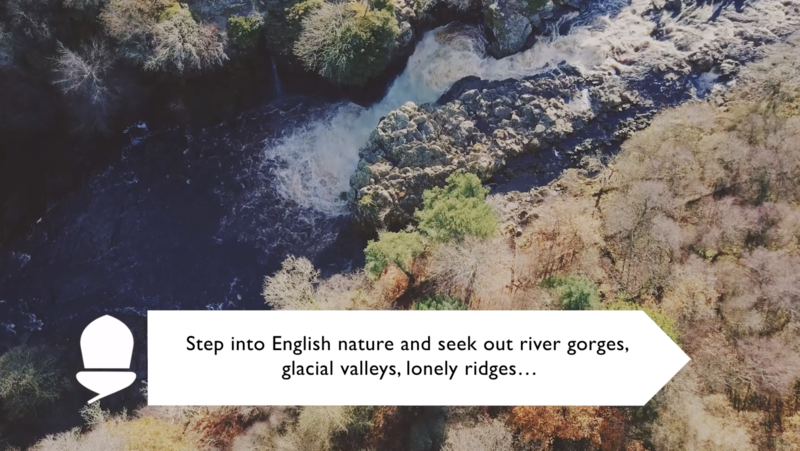 The Trail passes through some of England’s best landscapes and wildlife areas including three National Parks and various National Nature Reserves. The variety of habitats make it one of the best places in Europe to see birds like breeding waders in the spring and early summer. 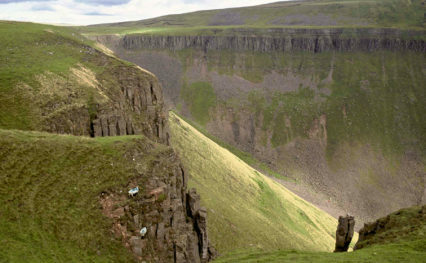 Walking the Pennine Way is a tour of spectacular natural landmarks and historic sites. At the start of the Trail in Edale you’ll walk up Kinder Scout, site of the 1932 Mass Trespass, which became a key moment in the struggle for public access to private land in the UK. 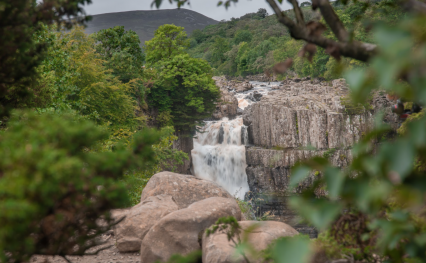 Alongside some of England’s best landscape and wildlife areas, other highlights along the route include Stoodley Pike, Top Withins, Malham Cove, Pen-y-ghent, Tan Hill, High Force, Cauldron Snout, High Cup Nick, Cross Fell, Hadrian’s Wall and The Cheviot. North Sea Ferries operate regular sailings between Rotterdam and King George Dock in Hull. From Hull, it’s possible to catch public transport to the start of the Pennine Way in Edale. The closest airport to the start of the Pennine Way is Manchester Airport. You can take a train from Manchester Airport (via Manchester Piccadilly railway station) to Edale – a journey which takes approximately 90 minutes. You can also fly into any London airport and catch a train to Manchester Piccadilly railway station, with a connection to Edale. To return to Manchester Airport from Kirk Yetholm, you can catch a taxi or bus to Berwick upon Tweed (changing at Kelso if using the bus) and then catch a train on to Manchester Airport. Regular train services also run from Berwick upon Tweed to London. It is also possible to fly out of Newcastle Airport. Catch a bus to Berwick upon Tweed, then a direct train to Newcastle and on to Newcastle Airport. The journey time is approximately 90 minutes. Both ends of the Pennine Way are accessible by public transport. Edale railway station is just a 5-minute walk from the start of the Pennine Way and is around 45 minutes from both Sheffield and Manchester by train. There are limited bus services to Edale, but you can find up-to-date information on www.traveline.info. 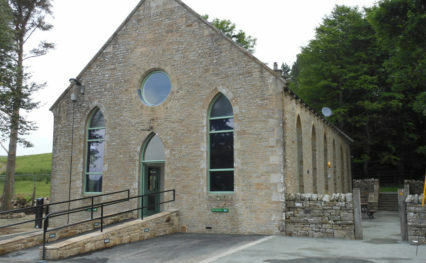 Aside from the railway station at Edale, other train stations directly on the Pennine Way National Trail can be found at Hebden Bridge, Gargrave and Horton in Ribblesdale. Alternatively, a short walk to Appleby from Dufton gives the option of catching a train on the iconic Settle-Carlisle line to return to Leeds or Manchester. At the end of the Trail, Kirk Yetholm has a bus service to Kelso (30 minutes). 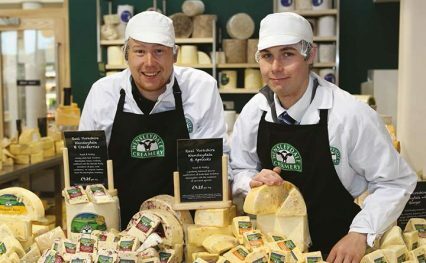 From here, you can catch a bus to Jedburgh and then on to Newcastle (90 minutes) or Edinburgh (75 minutes). Berwick-upon-Tweed is the closest train station to Kirk Yetholm (33km away, approx 2 hrs by bus, changing at Kelso) and is on the east coast mainline which offers direct rail routes to London and Newcastle. There is limited parking in Edale and it’s difficult to travel from Edale to Kirk Yetholm, so we recommend leaving your car at home and taking public transport to the start of your walk. This National Trail passes through the very best landscapes – places you may want to explore for several days at a time. From cosy country inns to characterful cottages, we’ve got your accommodation near the Pennine Way covered. You can find accommodation along the trail by using our interactive map.